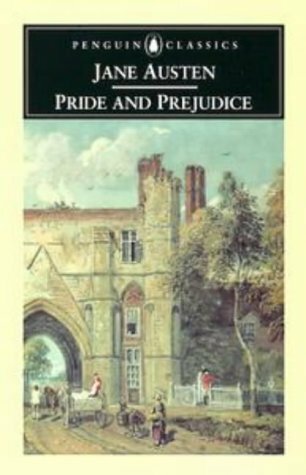 Pride and Prejudice, Jane Austen, Penguin Classics, 1997 (c1813), ISBN 9780140434262, 336pp. I am ashamed to admit it, but, yes, I have been reading for over 25 years and this is the very first time that I have ever read Jane Austen. None of her novels were required in high school, no literature class that I took in college used any as a text, and I had never thought to pursue her for sheer entertainment. It is quite sad, actually, for I find Austen much more accessible than some of the classic that I did have to wade through, including Wuthering Heights and The Scarlet Letter. Austen has recently seen a resurgence in popularity, likely due to the recent BBC and Hollywood adaptations of her books, including the Emma Thompson vehicle Sense and Sensibility. Pride and Prejudice was Austen’s second novel, following the success of Sense and Sensibility. Its original title was–and I’m not making this up a la Dave Barry–First Impressions. To my taste, this would have been a much more apt title, but it had been used by another author before Austen could get this book in print. The story is about the five Bennet sisters, who, while not orphaned or penniless, have few choices as to husbands because their father’s estate is entailed on a male heir, and they have no brother. The father seems to have resigned them to their fate, but their mother wastes no opportunity to arrange a good match for her daughters. The two oldest–Jane and Elizabeth–are level-headed and quite understand the position that they are in, but the youngest three are flirtatious and giddy, a bad combination in winning society’s eye. Disasters ensue when eligible bachelors Mr. Bingley and Mr. Darcy come to town, as well as the officers of the —shire regiment. The reason First Impressions would have been a better title is that each character–not just the main two, Elizabeth and Mr. Darcy–is constantly assuming things about other characters based on their initial reception of them. Mr. Darcy, in the country, is too proud to dance with any of the young women because of his mistaken impression that they are all declasse; Elizabeth forms her prejudices about Mr. Darcy because of her first meeting with him and this dance snub. The townsfolk think the best of Mr. Wickham because his first impression on everyone is quite favorable. And on and on and on. Very interesting, but it goes on forever, as the characters can never be quite direct given the mores of the time. That does not mean that they can not be insulting, as a particularly vicious exchange between Lady Catherine and Elizabeth shows. I’m glad that I have now broken my Austen fast, but I think that I can wait awhile before digesting any more.